Carlisle does prefinished hardwood flooring right. There are a lot of prefinished hardwood flooring products on the market, but many don’t measure up to the look and durability of standard hardwood flooring. Some have a plastic look to the finish, while others can’t be touched up easily and therefore become worn much more quickly. At Carlisle Wide Plank Floors, we’ve developed Custom Coat™ Prefinished Floors that combine the convenience and affordability of prefinished hardwood flooring with the beauty and durability of standard hardwood flooring. And because we specialize in wide plank flooring, our prefinished floors are made with wider, longer boards that bring out more of the beauty and character of the wood. Why choose Carlisle prefinished flooring? Carlisle prefinished hardwood flooring offers many advantages over other prefinished products. Higher quality. Our prefinished floors come in a variety of hardwoods, such as prefinished oak flooring. We also offer prefinished pine and hand-distressed wood flooring. Our products are finished with a high quality acrylic urethane that provides greater durability and makes them easy to touch up. And we offer prefinished flooring planks up to 12 inches wide – one of the widest in the industry – to allow more of the character of the wood to show through. More colors and design options. 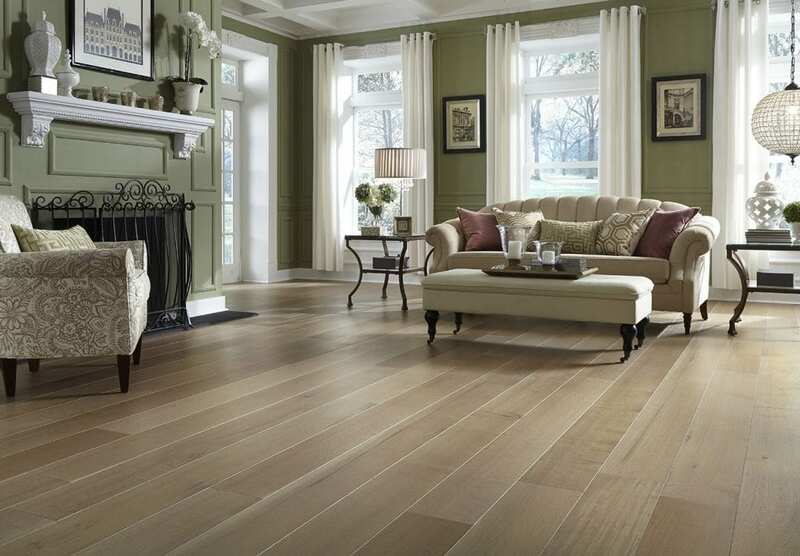 With Carlisle prefinished hardwood flooring, you aren’t limited to a specific line of color. We will customize your stain to match the color you want and will stain not only the face of the boards but also the tongue and groove, providing a higher quality finish, especially for dark wood floor finishes. Easier maintenance. Our prefinished flooring can be touched up without sanding using our Dustless Recoat Kit. And our products are one of the only prefinished floors on the market that can be refinished. Easier on the environment. Our finishes have no measurable VOCs, and there is no off-gassing onsite. More than prefinished floors: Carlisle’s new hardwood and reclaimed flooring products. New hardwood wide plank floors, including ash, birch, walnut, oak, cherry, hickory and maple wood flooring. Reclaimed wide plank floors, made from boards that have been taken from old warehouses, barns, homes and commercial structures. Engineered hardwood flooring, where a hardwood veneer is adhered to a less expensive backing to provide an affordable alternative to standard wide plank floors. Learn more now about Carlisle’s prefinished hardwood flooring.